Maine Lobsters, Kona Coffee, Russian Valley Wines: local culinary specialties, heritage foods, and autochthonous wine varieties have become objects of growing interest among growing segments of consumers in the Global North. Maine Lobsters, Kona Coffee, Russian Valley Wines: local culinary specialties, heritage foods, and autochthonous wine varieties have become objects of growing interest among growing segments of consumers in the Global North. Artisanal delicacies that claim essential and long-lasting connections with specific places, communities, and histories are widely available in stores and restaurants, prominently featured in media, and examined by cultural and political institutions. The value of food products is often determined not only by their inherent material and sensory characteristics, but also by their rootedness in specific human and natural environments. This shift in consumers' perception creates tensions in the market, especially around valuable and high price products, as we discussed in the blog about the cases of San Marzano tomato and extra-virgin olive oil. Inevitably, these issues turn political when economic interests and cultural perceptions are involved. One of the most visible cases in recent years is foie gras, as sociologist Michaela deSoucey explores in her book Contested Tastes: Foie Gras and the Politics of Food. Such controversies are an expression of what in 1981 anthropologist Arjun Appadurai called "gastropolitics," described by deSoucey as "conflicts over food that are located at the intersection of social movements, cultural markets, and state regulations... Gastropolitics permeates the spaces, rhetorics, trends, and social institutions that anchor episodes of contestation over food objects and culinary practices. Such episodes are situated in time and place, which can lead to very different outcomes in different social contexts." Although entangled in legal and commercial complications, such disputes reflect actual cultural and ideological differences in the way food is considered part of the identity of individuals and communities. DeSoucey observes that such debates often extend to involve ethics, i.e. judgments about right and wrong, and boundaries that define communities and identify insiders and outsiders. The difference in how the foie gras controversies are taking place in France and the U.S. reflects very different approaches to such moral issues. In post-industrial societies, consumption contributes to citizens' construction of their sense of selves and their cultural and social identities. As purchasing choices play an increasingly important role in defining who we are as individuals, food has moved to the center of political issues, social dynamics, and cultural preoccupations. Rural and artisanal traditions become anchorage for individual and communal identities threatened by globalized and seemingly unstoppable flows of goods, people, finance, and ideas, as well as sources of inspiration and emotional sanctuary. The sense of cultural loss and a lack of direct relationship with the origins of what consumers eat often lead people to look for forms of "tradition" and "authenticity." Both are powerful but difficult to define and highly contextual qualities that are now attributed to many foods. Tradition refers to a set of objects, practices, and values that are experienced as handed down from previous generations, ensuring the cultural reproduction of a social group. Such traditions, as critic Eric Hobsbawm observed, can be "invented," as a "response to novel situations which take the form of reference to old situations, or which establish their own past by quasi-obligatory repetition." The construction of traditions -- often with the goal of ideological legitimation of cultural, social, and political formations -- and the fact that they change over time do not make them less emotionally and practically "real" for those who are invested in it. "Authenticity" denotes instead the expected adherence of objects and practices to an idealized reality and genuineness. Traditions and authenticity can be ingested and experienced in the form of genuine food products with connections to real people and their stories. As it is to be expected, the desire for food traditions that have links with specific locations opens the door to manipulative advertising and marketing gimmicks, hyped by the nostalgia for pastoral good old days that may not have existed. In the process, and as a reaction to globalization dynamics that are often experienced as a threat to local specificities, the past becomes something to cherish and protect, something to be proud of, something that is essential to the survival of one's identity. In other words, the past is turned into heritage. 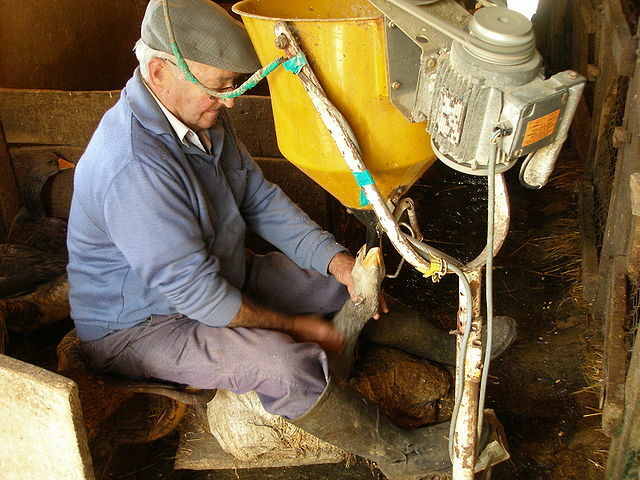 At the same time, as deSoucey demonstrates in the case of foie gras, when such traditions are transported to new contexts, their meanings and values become involved in different cultural and social negotiations, often with unexpected results. Moreover, everything becomes even more complicated when products are covered by legal protections, such as geographical indications and other place-based labels supported by national and international regulations. That's the case of products such as Champagne or Parmigiano Reggiano, protected by intellectual property rights. Those issues are the main topic of my new book Unequal Territories: Food, Power and Place in the Global Market, which will come out with Iowa University Press in 2017.